Golf injuries are often minor, but sometimes they can be really painful and hard to cope with. It will consequently affect your golf game and swing. Usually, they involve strained muscles, swelled tendons, or torn cartilage, not broken bones. Sometimes, they keep you from playing for a day or two. Other times, they keep you from playing for several weeks. Weekend golfers tend injure themselves because they’re either out of shape or fail to warm up properly. They also injure themselves because of bad mechanics, which often result from trying to do more than you can do or copying the swings of professional players. But, it’s not a smart thing to do because we just don’t have their flexibility. Some golfers lack the strength to lead the club into impact with the back of the lead wrist, as is commonly taught in golf lessons, creating wrist overload. Hitting the ground during the swing can flatten your wrist angle at impact, stressing the wrist’s extensor tendons. Both actions can cause tendonitis in the lead wrist. Rotate your lead wrist about 30 degrees away from your target to create the slight cup you need in your lead wrist at impact to prevent injury. One common injury is a strained lower back. The torque created by the modern swing pulls the ligaments, tendons, and muscles between the pelvis and lumbar spine. The shearing effect also wears away discs. 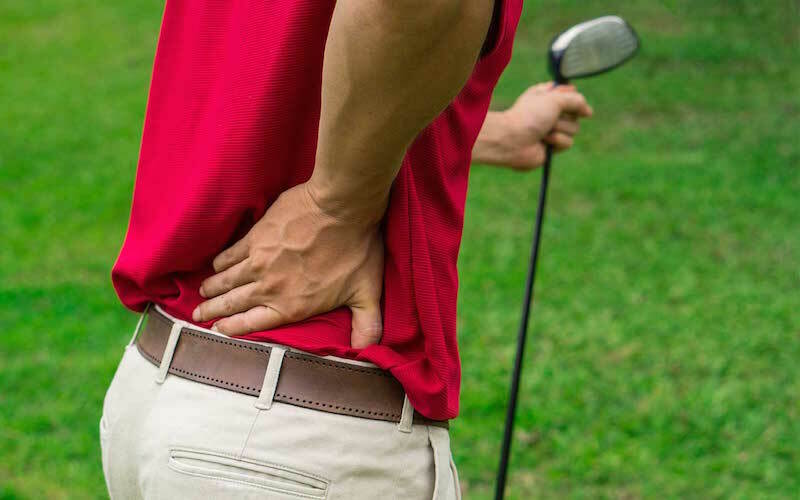 A strained lower back can disable golfers for several weeks, depending on its severity. To avoid straining your lower back, turn everything in unison. Hips and shoulders should rotate back and through together. Your knee takes a real beating when shifting forward in your swing. This injury can lead to articular cartilage degeneration and arthritis. In a correctly executed golf swing, the lead knee shifts early in the downswing. Thus, the knee has a line that’s vertical or leaning away from the target, not leaning toward it. To avoid inuring your lead knee, encourage your hips to turn more and slide less by rotating your left foot outward at address.